Although coyote attacks on people have been historically rare, this concern is not unwarranted in the light of more recent events. Such attacks have become more frequent as both coyote and human numbers have increased and merged in space and have been reported in several states (including New York), but most notably in California. Attacks have primarily occurred in suburban areas where coyotes have lost much of their fear of humans due to lack of pursuit and where associated with an easy food source such as garbage and pet food. In some cases, coyotes had been deliberately fed. The best insurance against coyote attacks is to 1) keep all garbage or other foods safely secured, 2) keep pets and their food indoors or safely secured if out doors and 3) harass any coyotes which come into your neighborhood by making loud noises - shouting, starter pistol, alarm devices, etc. If coyotes become persistent or unfazed, lethal removal may be necessary. 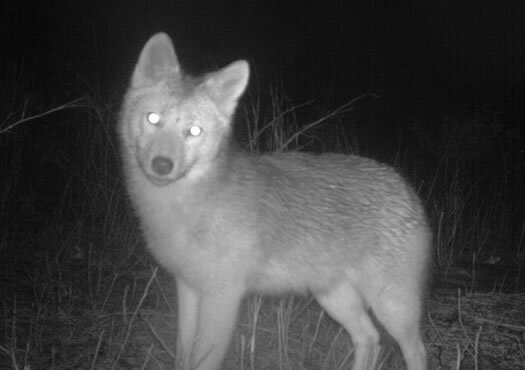 Attacks on dogs in rural areas most often occur during the coyote mating and pup birthing period - January through June - as a territorial defense behavior. Coyotes have frequently closely followed and sometimes attacked dogs when being walked by their owners - and sometimes the owners. Coyotes relish cats as food items. The story of coyotes in New York is interesting and somewhat understood. There are a few different ideas about how coyotes ended up here, but the most popular take is that the coyotes moved into New York over the last century, filling the space left behind after humans pushed out wolves. There's also DNA evidence that many of the coyotes in this part of the country are actually coyote/wolf hybrids (coywolves). Coyotes are very stealthy, capable moving through even densely populated (human) neighborhoods unnoticed. There was an interesting episode of Nature last year -- "Meet the Coywolf" -- that tracked a coyote through a suburban neighborhood. I saw a coyote hit by a car in Guilderland couple of years back. It tried to cross Western avenue near Western Turnpike golf course. We hear them all year long where I live in Nassau. It's usually just after dark and often spurred (it seems anyway) by police or fire sirens passing in the distance. In the early summer we also hear the pups practicing their noises, yipping and barking, which will sometimes get the whole pack going. Despite the large population around us we rarely see them though. I would say that we are still rural enough that they have a healthy respect for people and our space still. Saw a coyote passing through the woods in my back yard. I am in the pine bush. It was beautiful, looked strong and healthy.